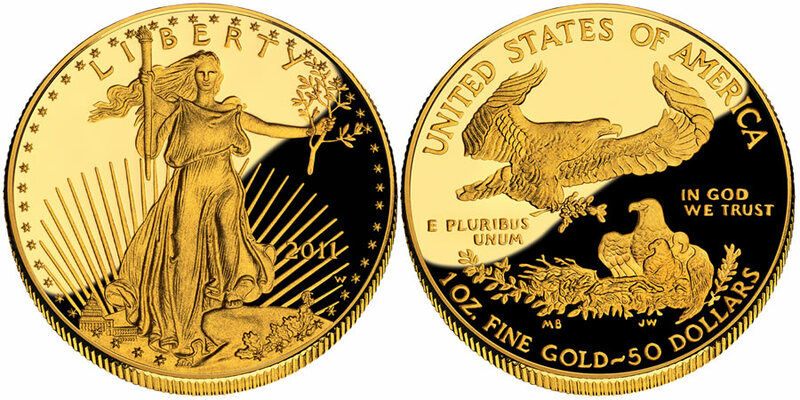 The 2011 American Eagle Gold Proof Coin will continue a series strikes that initially launched from the US Mint in 1986. A release date of April 21, 2011 was used by the Mint for the Gold Eagles. These coins are typically struck by the US Mint in four different sizes from 22-karat gold - a one ounce Eagle, a 1/2 ounce Eagle, a 1/4 ounce Eagle and a 1/10 ounce Eagle. All four contain the same designs with the only difference being the inscriptions showing the coin's weight and face value. Each of these coins are struck to proof quality for collectors, but the Mint also produces a Gold Eagle bullion coin. The bullion strikes are minted for investors as a low-cost method of adding gold to their portfolios. In fact, the bullion strikes are responsible for the only year since their debut in which the Mint did not produce the Proof Gold Eagles - 2009. That is because investors were purchasing the bullion Eagles is such high quantities that the Mint was forced to cancel the Proof Eagle production and divert all available blank planchets towards the bullion coins. "Liberty" is shown on the obverse of all of the Gold Eagles with a torch in one hand and an olive branch in the other. It was originally designed by Augustus Saint-Gaudens and first used on the $20 Double Eagle Coin in the early 1900's. Many consider this design to be one of the most beautiful ever struck on an American coin. Also visible is the capitol, the year, and the word "LIBERTY". Mrs. Miley Frances Busiek designed the reverse to show a "Family of Eagles" with the male soaring above the nest. Also included are the words "UNITED STATES OF AMERICA", "E PLURIBUS UNUM", and "IN GOD WE TRUST". The amount of gold content and its corresponding face value are shown as well.